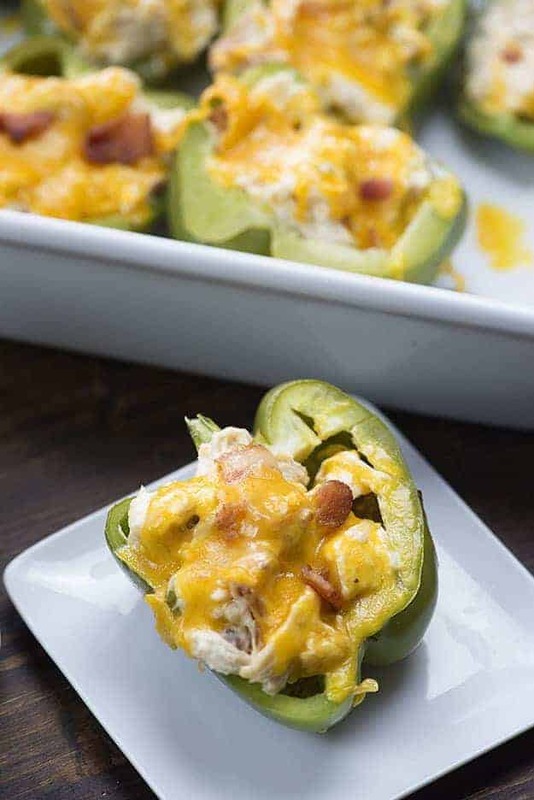 These keto stuffed peppers are full of a spicy homemade jalapeno popper dip combined with chicken for a low carb option that is packed with flavor. 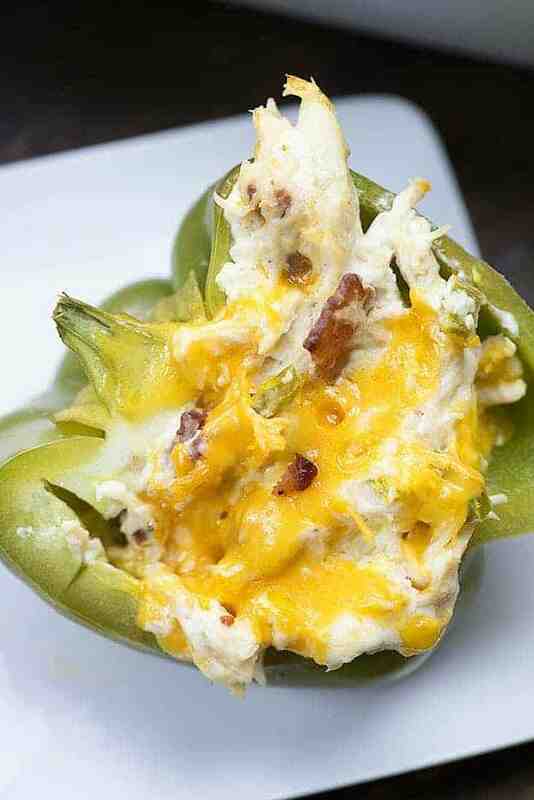 You can make these as spicy or as mild as you prefer, because these low carb stuffed peppers are totally customizable! I didn’t always love bell peppers. In fact, I was well into my upper 20s before I really even thought about giving them a chance. I blame green peppers on this. I’d only ever tried green peppers as a kid and had no idea that red, yellow, and orange peppers were sweeter and more mild tasting. Once I tried a red pepper and realized I loved it, it didn’t take long for me to get used to the green peppers. You can make stuffed bell peppers with any color pepper you prefer, but these days, I normally use green peppers. There are a bit more carbs in the sweeter, more ripe red peppers, but not a whole lot. Still, if you’re on a keto diet and sticking to 20g net carbs a diet, every carb counts, right? I make stuffed bell peppers a little differently than most people, because I slice the peppers in half and fill each half. 1.) Peppers do contain carbs and by cutting them in half, you’re really maximizing the amount of filling per pepper and making it a whole lot easier to eat half of a pepper rather than a full pepper. 2.) It’s a heck of a lot easier to fill and cook a pepper laying down on it’s side than it is to get them to stand up on their ends. Some peppers are weirdly shaped on the bottom and just don’t want to stand up for you, ya know? There is no need to parboil your peppers before popping them in the oven if you follow my easy trick of adding a couple tablespoons of water to the bottom of your baking dish and then covering the pan tightly with foil. The peppers steam to perfection this way. Like I mentioned above, I don’t parboil my peppers. I slice my peppers in half, stuff them, and then lay them flat in a 9×13 baking dish. Add 2 tablespoons of water to the bottom of your dish and cover the pan tightly with foil. The peppers should be tender-crisp in 35 minutes, but feel free to adjust the cooking time to suit your own preferences. Some people prefer extra crunchy peppers and some people prefer soft peppers. When people think of stuffed peppers, they usually imagine them filled with rice, but that definitely doesn’t have to the be the case! 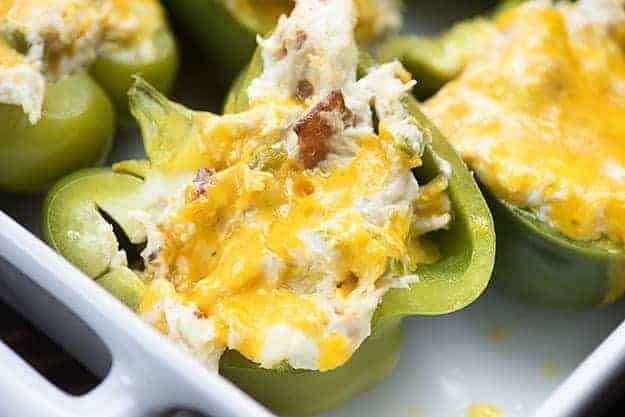 Cream cheese is a great base to hold together your ingredients and add the fat that is needed to make your stuffed peppers recipe satisfying and filling. 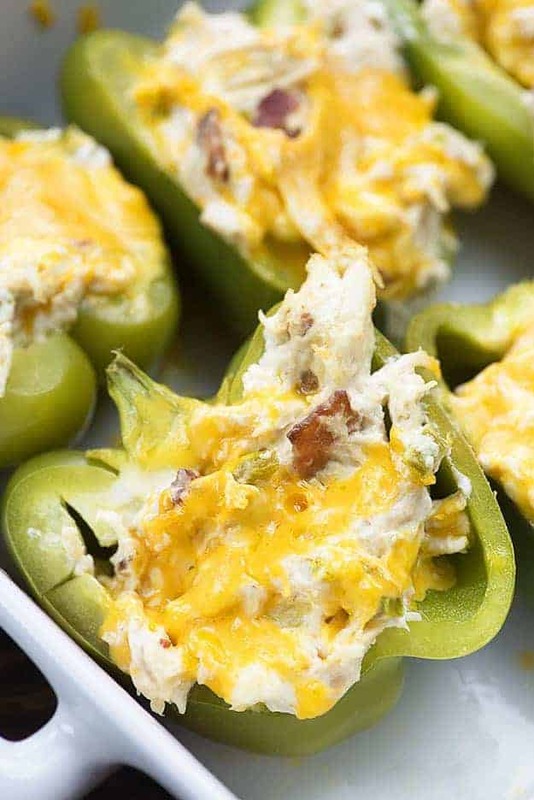 This stuffed bell pepper recipe is full of jalapeno popper dip! 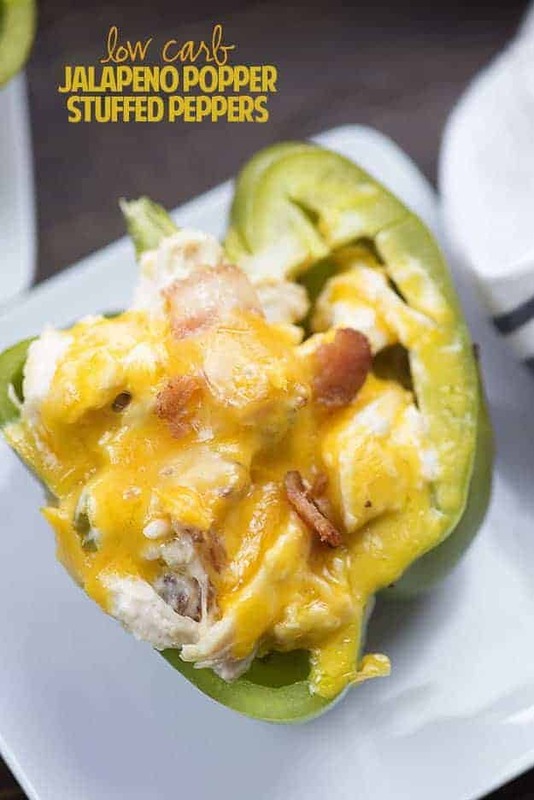 I filled this easy stuffed peppers recipe with a mixture of jalapeno popper dip, bacon, and shredded chicken. The fat and protein keep you full and the flavors are just phenomenal. 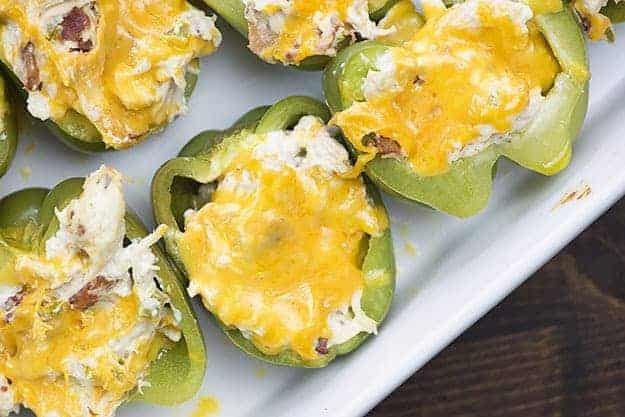 I think you’re going to love this keto stuffed peppers recipe. 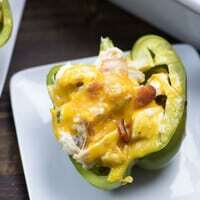 This isn’t a traditional stuffed pepper recipe – it’s even better! 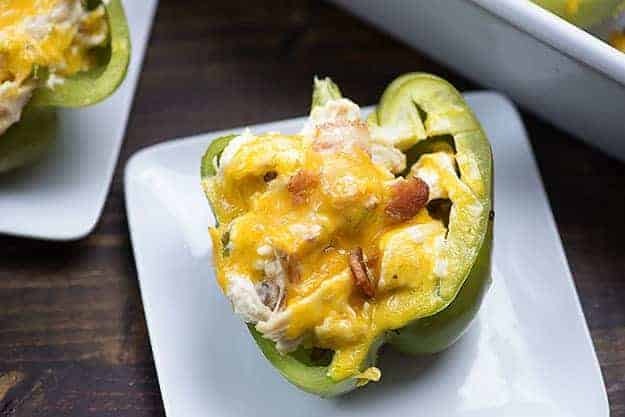 These keto stuffed peppers are full of spicy jalapeno popper dip and shredded chicken for a low carb dinner that is satisfying and filling. Preheat oven to 350 degrees. Add 2 tablespoons of water to a 9x13 baking dish. Slice each pepper in half from top to bottom. Remove the membrane and seeds and place the pepper halves in a 9x13 baking dish. Add the cream cheese, chicken, jalapenos, mayonnaise, bacon, 1/4 cup of cheddar, and all of the Parmesan to a medium mixing bowl. Stir well to combine. Spoon the filling evenly into each pepper. Sprinkle the tops of the peppers with the remaining cheddar. Cover the pan tightly with foil and bake for 35 minutes, or until the peppers are done to your liking. These peppers are to die for!!! Followed recipe exactly and they turned out perfect! My husband is already requesting for me to make them again! I’m so excited about your new blog and I plan to make the broccoli salad today and your deviled eggs for a BBQ we are attending tonight! Thanks for sharing these recipes! What’s the nutritional value of the protein? I’m really weird about keeping food more than a few days in the fridge myself, but Google says 3-5 days should be fine. I made these, and my family and I simply loved them. Thank you, thank you.